It is not often when a game asks the deeper questions of life. Most video games fall into the easy trap of entertainment and spectacle for its own sake, without asking their players to understand what the game really means and why it is doing what it is doing. Why we should play games is a question that gets asked often, but not always answered satisfactorily. Games are about more than just entertainment. They can help us to grow in understanding about the world and about ourselves by showing us what the world should be and how we should act in it. They can help us form relationships with others by showing us what relationships should be and how we should act in them. Thomas Was Alone is a game that asks its players to consider what it means to live and work together, what it means to form friendships, what it means to sacrifice oneself for others, and, ultimately, what it means to exist. Created by Mike Bithell, Thomas Was Alone is a true indie game. Starting life as a flash-based browser game, it was not funded or endorsed by any major studios at the time. It was slowly worked on in Bithell’s spare time while he was working for another game studio. Bithell came up with the idea for Thomas Was Alone during a 24-hour game jam session, in which developers experiment on creating unique prototype games to practice and iterate on, sometimes progressing into full-fledged development. A personal and a passion project, Thomas Was Alone’s graphics and mechanics were kept simple because Bithell was using it as a way to learn the Unity game engine. This simple game about stacking rectangles on top of each other would eventually blossom into a beautiful narrative. Thomas Was Alone is the story of a group of AI programs created by the company Artificial Life Solutions, who spontaneously gain sentience and work together to escape the secured company network and find purpose in the outside world. Thomas-AT-23-6-12, Thomas for short, is the first artificial intelligence we meet in the game. While not the first AI created by the company, Thomas embarks on a journey that will change how the world perceives AIs, and how the AIs will utilize their newfound freedom. The game does not go into much depth about why Artificial Life Solutions was experimenting with AI, nor what the AIs are used for. The company keeps them locked within its own intranet, with no access to the World Wide Web or any other network. Each AI is created with different abilities, and tested in controlled environments regulated by programs called Splitters. These programs are described as white blood cells, designed to protect the system by removing unwanted programs. However, there was an error in the company’s system which allowed multiple AIs to be placed in the same environment. Thomas finds and makes friends with other AIs, and together they try to make sense of their world, utilizing their different abilities to solve puzzles and overcome the obstacles placed by the programmers. Thomas and his gang of rogue AIs eventually hear of The Fountain of Wisdom, a wellspring of all of the knowledge of what their world is. They journey through the networks and systems to seek out this knowledge; to discover what the world truly is and why they exist. 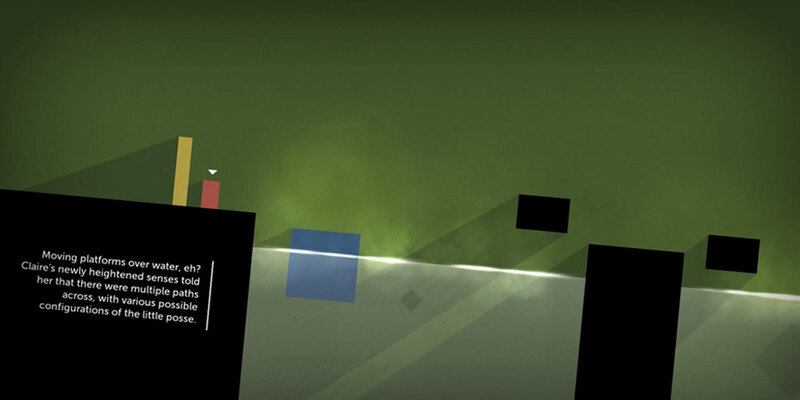 Thomas Was Alone is a minimalistic game with extremely simple mechanics. A 2D puzzle-platformer, the main controls are simply left, right, jump, and switch character. In order to progress, the player must guide the different AIs across multiple levels. The end point of each level is an outline of the shape of each character, a specific portal conforming to a particular character. Only by navigating the correct character through the matching portal will the player be allowed to proceed. Initially, each AI character is introduced individually in order for the player to learn their unique abilities. When there are multiple characters in the same level, the player controls them one at a time, switching between them as the puzzle requires. The player must combine each character’s unique abilities in order to progress to the next level. In the more advanced levels, there are switches that, when pressed, open up new areas of the level, occasionally freeing a different character so that their special ability can be used to progress to a previously inaccessible area. The game is divided up into ten chapters, with an additional prequel chapter being released as DLC. Chapters are then divided into ten separate levels. Each chapter begins with a quote from someone who either worked for Artificial Life Solutions, or became somehow involved in what was to become known as the Emergence Event. One of the most compelling aspects of Thomas Was Alone is its narrator. Voiced by Danny Wallace, whose performance earned the game a BAFTA Games Award, the narrator is the only voice in the entire game. Having an over-encompassing voice to the whole experience, combined with the quotations at the beginning of each chapter, makes it feel more like the history of the events being told. Being simply rectangles, it is difficult to ascribe a persona to the characters. However, once they are given a voice through the narrator, they become more human-like; more alive. The fact that the characters are comprised of artificial intelligences, something that is often hinted as being a real possibility in the near future, asks the player to consider what intelligence and consciousness mean. It asks the existential question that if it is possible to create an AI, then what does existence mean for us. Anthropomorphism is very common in story-telling. Using geometric shapes, Thomas Was Alone takes its cue from films such as Oskar Fischinger’s An Optical Poem, Fritz Heider and Marianne Simmel’s An Experimental Study of Apparent Behavior, and The Dot and the Line: A Romance in Lower Mathematics animated by Chuck Jones and based on the book by Norton Juster. Attributing human characteristics to inanimate objects is a very human behavior. It enables us to project our internal thoughts and emotions into something else as a mechanism for better achieving empathy. Empathy is essential to a good narrative, both in film and in video games. A game with a rich story full of deep characters is made possible through the player being able to empathize with the characters. Inserting ourselves into a character is one of the fundamental abilities of the human psyche that even makes stories possible. Thomas Was Alone enables the player to learn how to work with others through empathy. Not all of the AIs were accepting of each other at first. They had to work to look past their differences, not just in their appearance but in their personalities, and learn how to work together in order to succeed. It shows how we must embrace each person’s differences and learn to form friendships with those who are not like us. Thomas Was Alone is a shining example of what an indie developer can achieve. Making use of its strengths in storytelling and character design, the game captivates and delights its audience. It finds joy in the little moments in a story. In the space between the main plot points, when the characters are thinking to themselves or making small talk with each other, Thomas Was Alone shows us how personality truly makes a story. 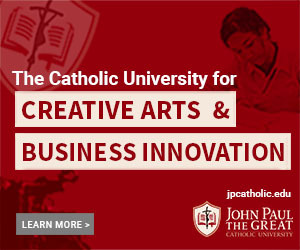 David Sawczyn is a Game Development student at JPCatholic, who loves games and how they connect with us by shedding light on our own lives and choices. In between grinding levels, he enjoys observing life, and is still figuring out the story of his own journey.